Here's the first in what will hopefully be a frequent feature here on the blog: Best TV Moments, for those remarkable scenes that make us laugh, cry or stand up off our couches and clap. 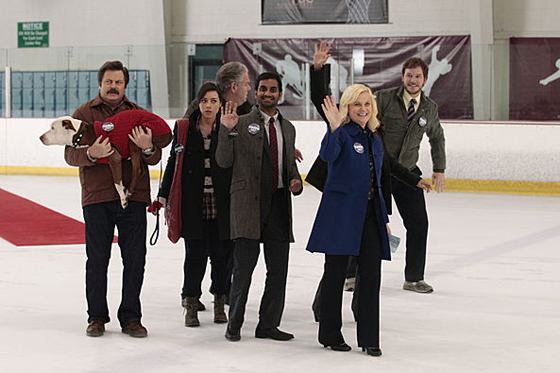 The first such notable scene comes from last night's Parks and Recreation episode, "The Comeback Kid," in which Leslie Knope relaunches her City Council campaign after last year's scandal saw her campaign team's departure and her poll numbers drop down to 1%. Aided by her new campaign staff—a.k.a. the Parks Department—Leslie planned an event to get her back in the public's good graces. Naturally, all did not go as planned, culminating in a side-splitting sequence of hilarity that is well-deserving of a Best TV Moment mention. And now I can't stop laughing whenever I hear—or, hell, think about—Gloria Estefan's "Get On Your Feet." Which is why it's on loop all day today.